Early Saturday morning, the troop headed east into Georgia for its first camping trip at Lawhorn Scouting Base, a facility of the Flint River Council, which is based in Griffin, Ga. 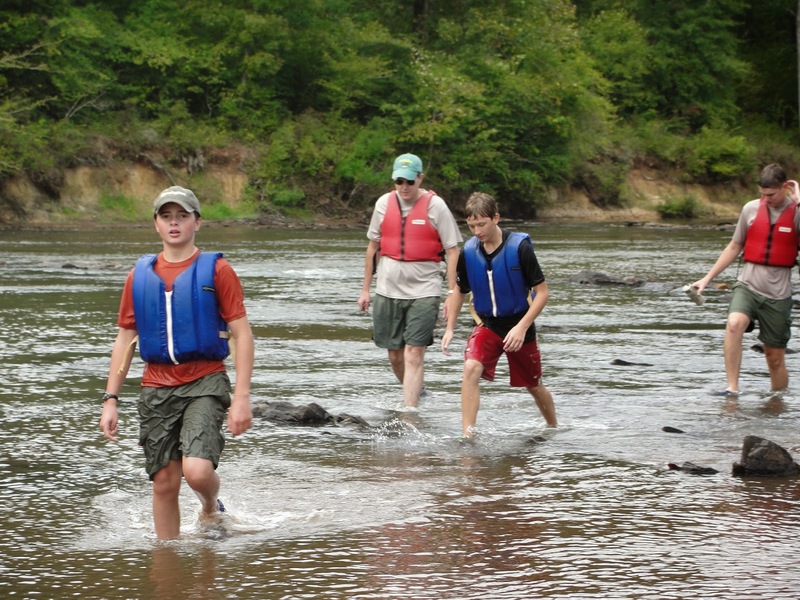 The 2,400-acre facility, based in Molena, Ga., includes three program areas: its traditional camping facility, Camp Thunder; multi-use wilderness Pine Mountain Backcountry area; and the destination for Troop 50's visit, the Flint River Adventure area. 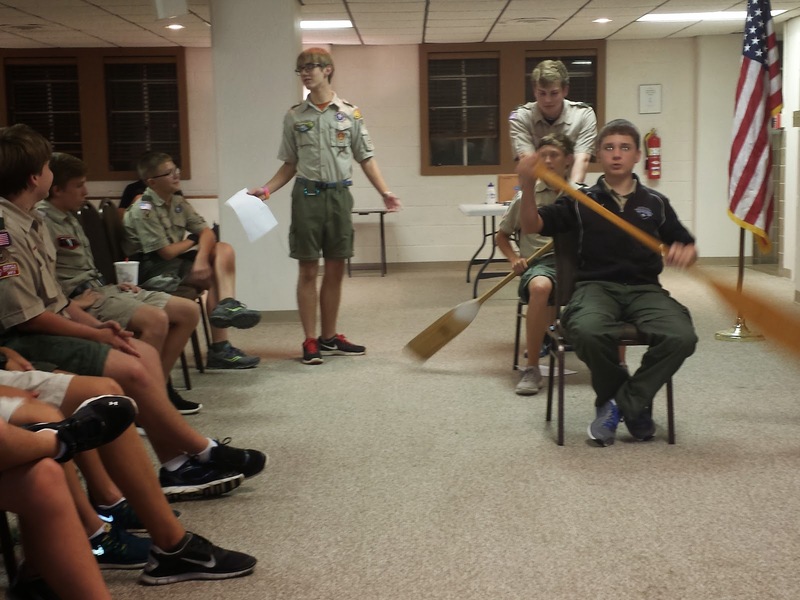 Scouts began preparing for the trip earlier in the week at its weekly meeting, when the Buck Patrol offered an overview of safety afloat and canoeing basics. Scouts and leaders suited up and ready to hit the water! 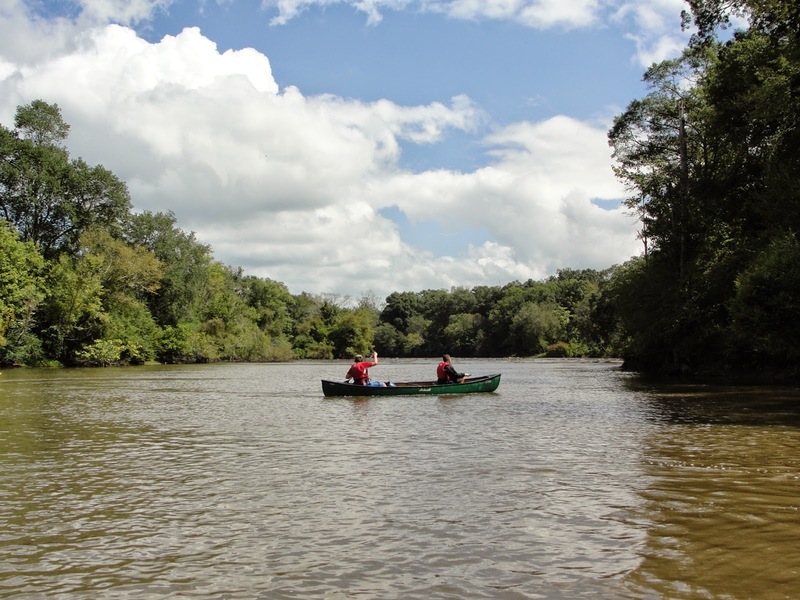 Soon after arriving at Lawhorn Scouting Base, Scouts and leaders went straight into "canoeing mode" by grabbing their PFDs and paddles, taking the bus to the take-out spot, and pairing up in their canoes for the nearly three-mile stretch of the Flint River. While the morning started out overcast, the early-morning cloud cover meant lower temperatures for the start of the trek. By the time the troop stopped for lunch about an hour and a mile and a half into the trip, the clouds gave way to blue skies, which added even more to the river's picturesque landscapes. Scouts broke into patrols to enjoy the lunches prepared before departing camp. 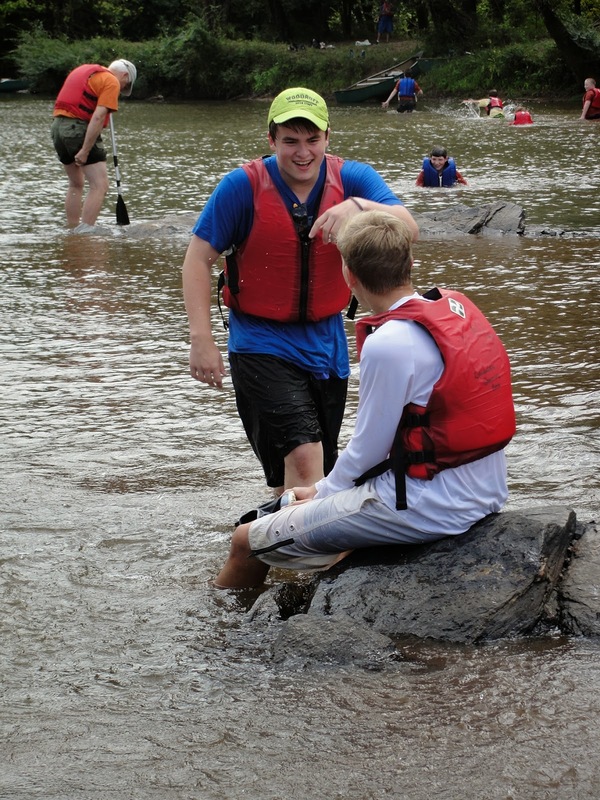 Following lunch, the troop waded into the river and explored the various rock groupings in the middle of the river. The cool water took some adjusting to, but the now-sunny skies helped take some of the chill out of the water. 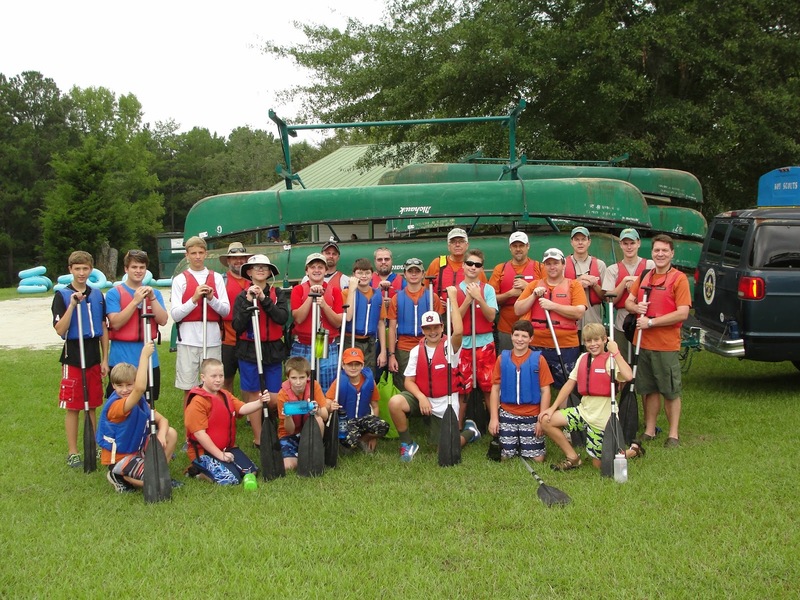 The group returned to the canoes for the second leg of the trip. 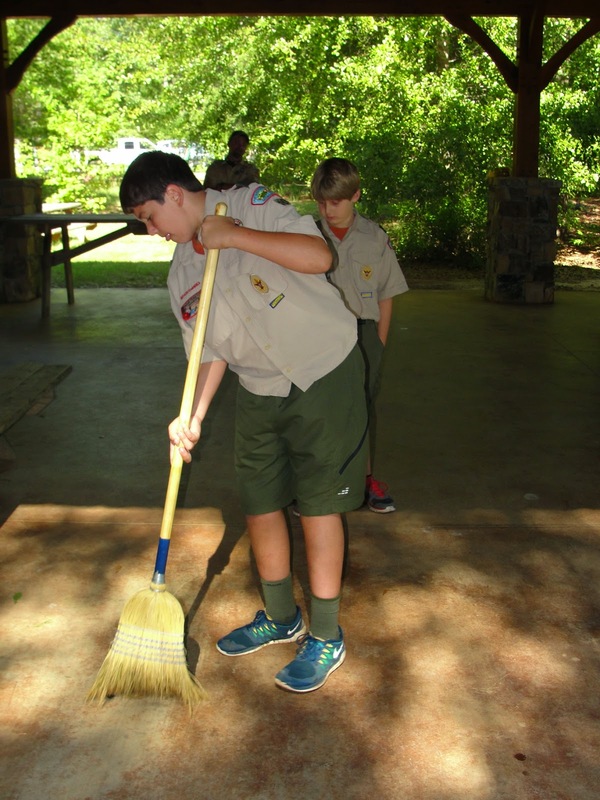 Some Scouts got adventurous by tipping, then draining, their canoes. Before we knew it, we were on the banks of Lawhorn Scouting Base and the end of our journey. The troop made its way back to its lakeside campsite by foot to pitch tents, finish setting up camp, and enjoy a leisurely afternoon of fellowship and some impromptu football. Not totally roughing it, a small group (of Scouts and leaders) huddled around some portable technology to monitor the afternoon and evening's various college football games and scores. 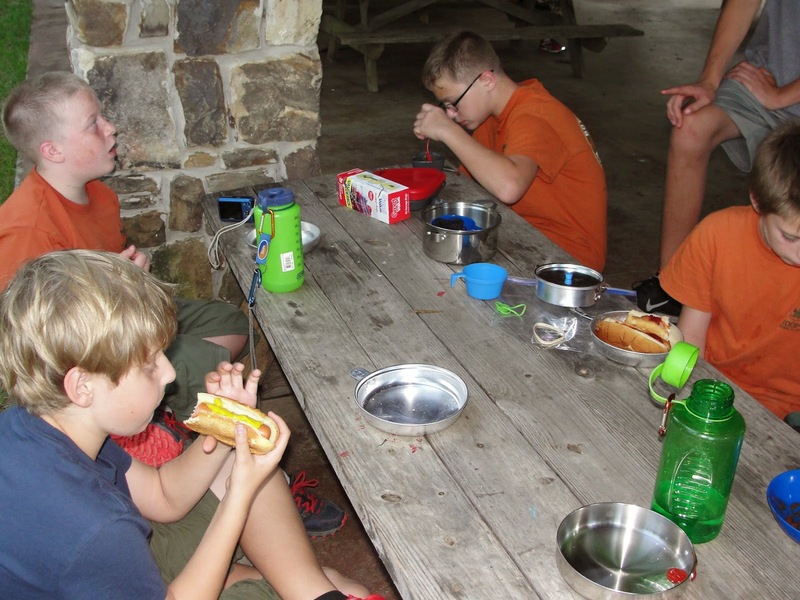 Scouts enjoy time to socialize over hot dogs and chili dogs. As evening approached, both patrols, as well the group comprised of Leadership Corps members and leaders, began preparing their respective dinners. Coincidentally, both patrols planned identical dinners centered around chili dogs. Pooling together a few items from personal freezers, the adults cobbled together a dinner of venison shish kabob, corn on the cob and potatoes. There was an attempt at troop-wide campfire, but as the two skits revealed, Troop 50 might be challenged severely if it ever makes a run for America's Got Talent. how to use a broom! Sunday morning included breakfast preparations and campsite cleanup. Taking a break to continue allowing the tents wet with morning dew to dry, the troop gathered for a devotion. Led by Mr. Tullier in his role as troop chaplain, Scouts and leaders discussed being in and getting out of the slumps of life in the context of Psalms 13. With tents rolled up and the trailer packed, the troop headed out around 10:30 a.m. CT for arrival in Auburn around noon. At the troop's Patrol Leaders Council meeting Monday evening, the members of the PLC gave high marks to the Lawhorn Scouting Base's facilities, including our campsite, its pavilion and nearby bathhouse (with warm water! ); other facilities the troop might go back for, such as the "playground" with Scout-oriented physical and team challenges close to our campsite, and the lake waterfront with inflatable iceberg; and, of course, the canoeing and the great morale everyone had while on the water. Youth leaders will work to ensure some elements — such more challenging and innovative menu planning, more organized duty rosters, and better coaching for younger scouts — are incorporated in upcoming campouts. 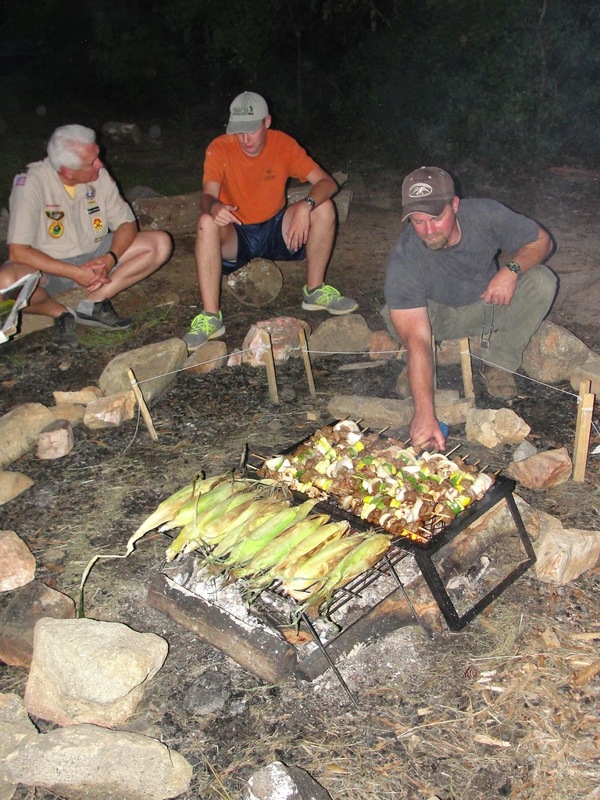 To view additional photos from the campout, visit the troop's online photo album.